Hurrah! The incessant airing of mean-spirited “political ads” that are almost without exception nothing but character assassinations will now cease! For the hundredth time, no one has a monopoly on truth and wisdom and neither does any ideology. Have you ever heard of Galloping Gertie? On this day in 1940 the Tacoma Narrows Bridge collapsed during high winds. The footage (this is supposed to be in the public domain) is still quite fascinating to me. The bridge had only opened in July of 1940. At its opening it was the third longest longest suspension bridge in the world. The oscillations during windy conditions were apparent even during construction. All efforts to mitigate the unwanted motion were, obviously, unsuccessful. All endeavors of people have the potential to be flawed, and most of them are, because all people are flawed. From the Wikipedia article a picture of the Tacoma Narrows Bridge. 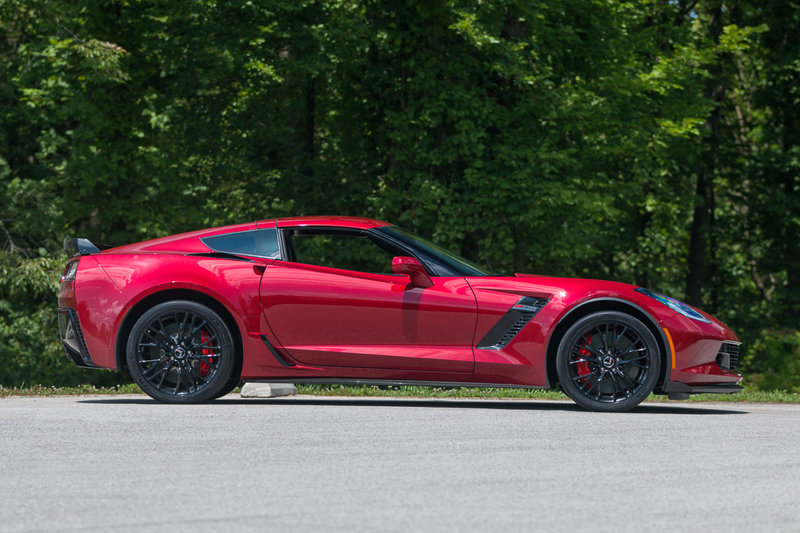 From fastlanecars.com a picture of a 2015 Corvette Z06. This car is powered by a 6.2 liter (376 cubic inches in Bill Stephens-ese) supercharged V-8 that produces a peak of 650 HP and 650 LB-FT of torque. The engine designation for this beast is the LT4. The person with whom I’ve been talking about doing my build hasn’t specifically said that the LT4 is available. He has mentioned the LS9 engine that was used in the ZR1 version of the C6 Corvette. The LS9 is also supercharged and also produces in excess of 600 HP and 600 LB-FT of torque. Still, with unlimited funds (that is the scenario I’m writing about here) I think an LT4 would be possible. The LT4 is listed as an available crate engine on Chevrolet’s website. I don’t know if I could live with supercharger “whine” every time I drove the car. A supercharger also adds to the complexity of the car. I am a big believer in KISS (not the rock band). This drivetrain is much more expensive than the one I am likely to use if I build the car from scratch, but I am writing about not having any budgetary constraints. Not only is the LT4 engine more expensive than an LS3 or LS7, but an 8L90E (eight-speed) automatic transmission is more expensive than any four-speed automatic. Still, imagine a reliable and drivable car weighing barely 3,000 pounds with 650 HP/650 LB-FT. Sounds like fun to me. Have any of you built a car or had one built for you? If so, what was the car? What was your experience? I think about this build every day. I hope the reality can at least come close to the idea. Steve Dallas, feel free to chime in. If you’re here after clicking on a link in the Corvette Forum, welcome. Please bookmark the blog URL (https://disaffectedmusings.com) and return often. Thanks. Almost six percent of the views this month are from Canada. That number is WAY up from before. I would love to hear from Canadian readers. Thanks. Hurrah to the end of election season! And I totally agree with you – if no one is perfect, no one can create a perfect thing. But attempts to improve can bring a creation a bit closer to perfection. Wonderful contribution to the discussion, Philip! Thank you. Your C2 restomod will be a rear-wheel drive and therefore will have relatively light weight over the rear wheels. Maintaining traction will be more difficult so too much horsepower is a serious design parameter. My F-1 Ford pickup is also light over the rear wheels unless I am carrying a heavy load in the bed. I considered more horsepower than the 450hp of my Ford Windsor crate motor but opted for the 450 hp number considering my truck will not usually have a “heavy” load. It will be used for hauling on occasion but not usually. How you intend to use your car should factor into your design considerations.